Throughout my life, I have held many jobs--dishwasher, barista, ice cream scooper, artist assistant, waitress, babysitter, copywriter, student, personnel manager, marketing assistant, marketing coordinator, trainer, cook, painter, illustrator, graphic designer, website manager, writer, database designer, counter girl, tarot reader. 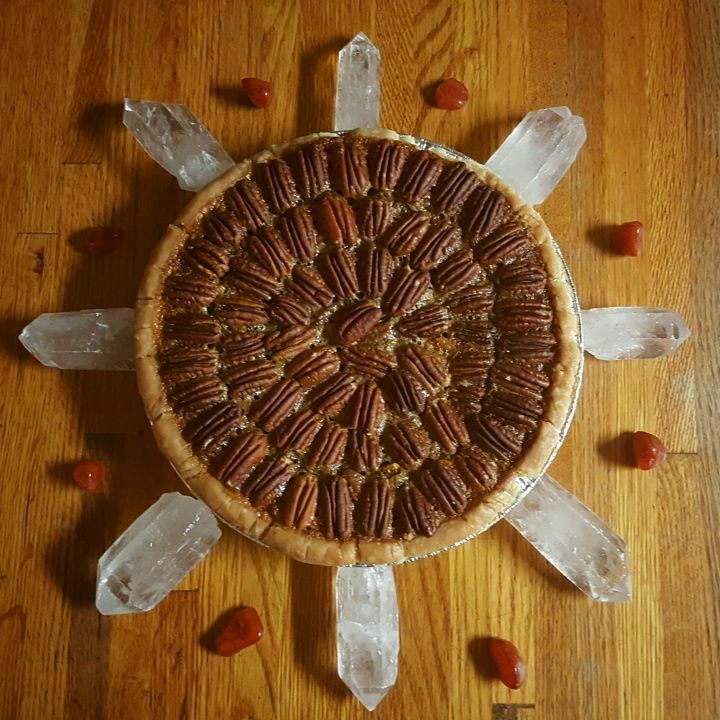 Now crystal healer, crystal coach, energy worker, sacred artist, and writer. I have loved each one of job for their unique gifts (yes, even dishwashing!) I began working at age 13 at a local restaurant and pub and I didn't stop working until I decided to stay home with my daughter Beatrice. And then work was 24/7. No performance reviews. No raises. No vacation. No clocking out. That job has been my most fulfilling, most challenging, and most enlightening. I has also kept me teachable and humble. My children often teach me how to mother them, and how to nurture them. One loves cuddles and kisses and flowery language, the other loves to wrestle and have his distance until he is ready. Parenting gives me an opportunity to practice the spiritual principles and tenets I hold most dear in all moments of my day. Testing my patience daily, parenting challenges me to reflect, embrace and honor the deep, limitless well of unconditional love that we all possess. It also challenges me to accept the parts of me I find most difficult to love. I could go on and on about being a mother, but suffice to say, I now try to approach all things with the same humility. Last year, I graduated from Hibiscus Moon Crystal Academy with a CCH, or Certified Crystal Healer certification*, having completed level II of Reiki. 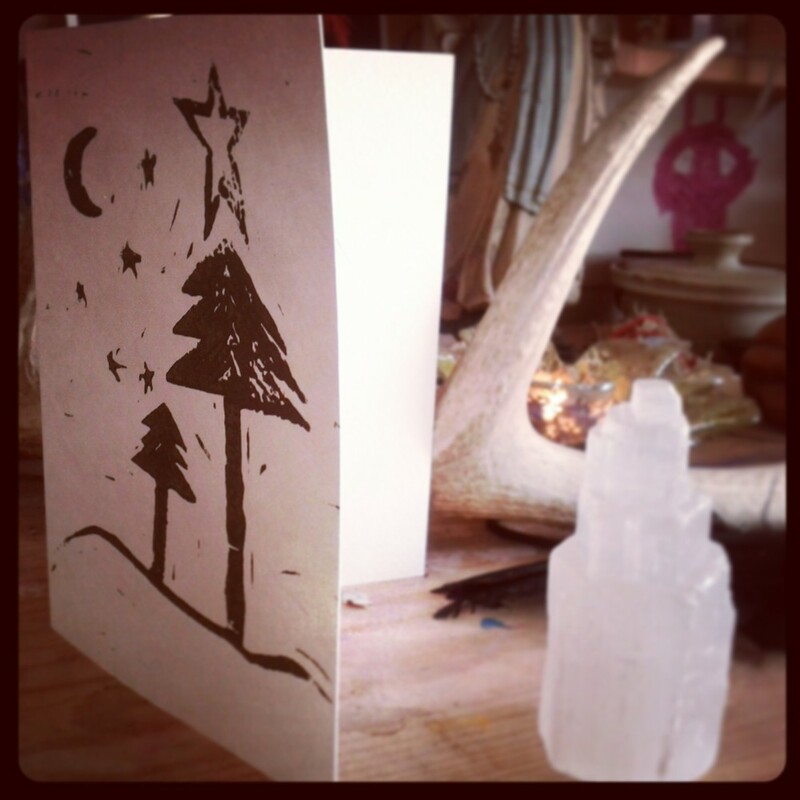 All these things I loved to do were bubbling up--painting, creating jewelry, writing, crystal healing, energy work, reading cards...I birthed another child last year, the Moon + Stone Healing Studio. 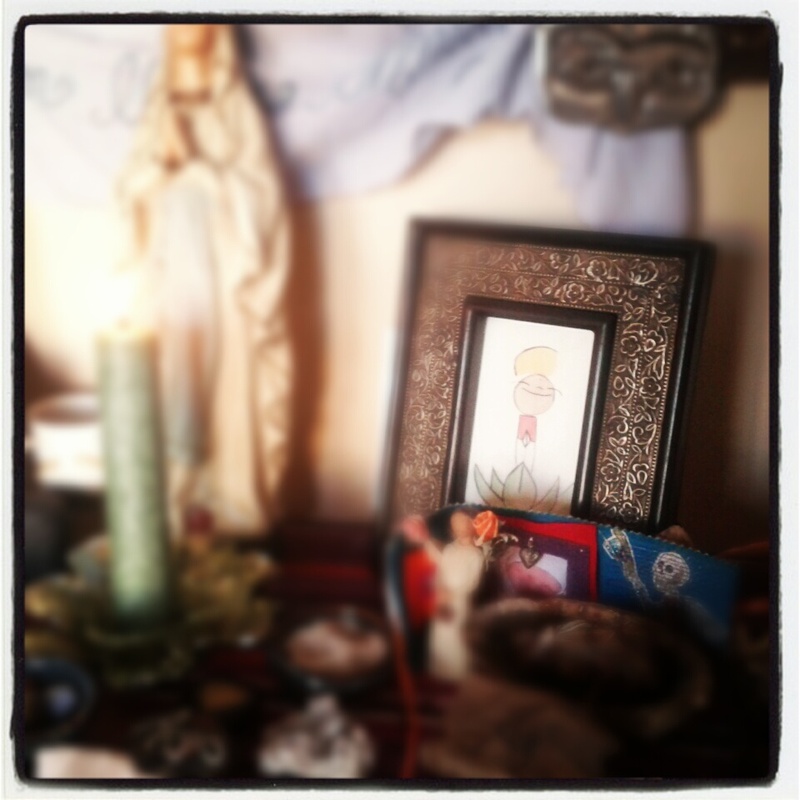 When the vision came, the name quickly followed--a place that combines sacred art, writing, healing work, gentle wisdom, tarot, and crystals, yet gave me room to be present with my children and husband, When it all fell into place, I knew, without a doubt, that the Moon + Stone Healing Studio was my path. It has been challenging, requiring a different kind of patience, hard work, perseverance, and dedication than raising my children, but many of the lessons that have come to me through the Moon + Stone are similar to the ones I learned through parenting. My lessons involve authenticity, honesty, unconditional love, and self-acceptance. I learned some hard lessons about wounded healers, and the ways in which I am also wounded. And I have met so many more amazing women and men on this journey with the Moon + Stone. It is the place I belong, it is the Roots I had been deeply seeking. After establishing a nice clientele in the brief four months the Moon + Stone Healing was located in South Jersey, I picked up and moved to an area where I knew no one, had no community, no colleagues. So much of what held me back in my previous incarnations was my fear of vulnerability. When I came here, I went into places, introduced myself, put my hand out, and said, "I'm new here. I am a healer. What can you tell me about this place?" Three years ago, I would have been incapable of putting myself out in this way. A cashier at the Giant offered to go out for coffee with me. 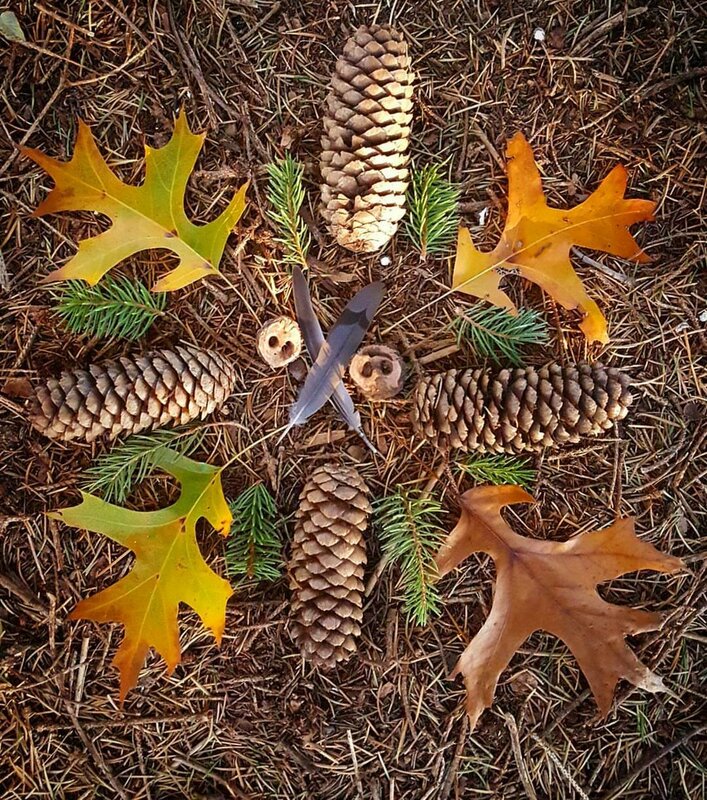 Women invited me to gatherings, and healing circles. A new friend Kathleen invited me to a Shamanic Healing circle at a local Wellness Center. It was there that Sharon Muzio asked me to come talk to her about working with her. In June, I joined Alta View Wellness Center as a practitioner. The Moon + Stone Healing morphed again into a different studio for crystal healing jewelry and products and a home for my writing. At Alta View, I am surrounded by such incredible, warm healers. It is the nurturing, nourishing environment I have been craving for decades. I am so grateful to be a practitioner in Sharon's practice. 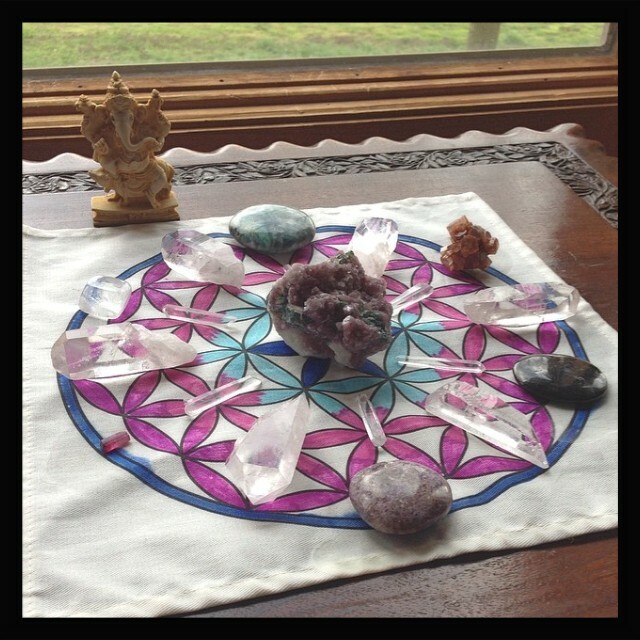 I am still establishing my clients at Alta View, and getting the word out about crystal healing, which is a bit difficult for this overachieving healer, but I absolutely feel at home at Alta View. My Moon + Stone Healing jewelry has also found a home in Alta View's beautiful boutique. One year ago this month, I launched the Moon + Stone Healing, and I feel so honored to be here, so honored to walk this path with you. In celebration of a year of the Moon + Stone, I want to thank you for reading, following along, joining my classes, booking sessions with me, and ultimately for allowing me to walk this path with you. Bowing deeply to each of you. To thank you, I want to gift two of you with something from my hands. 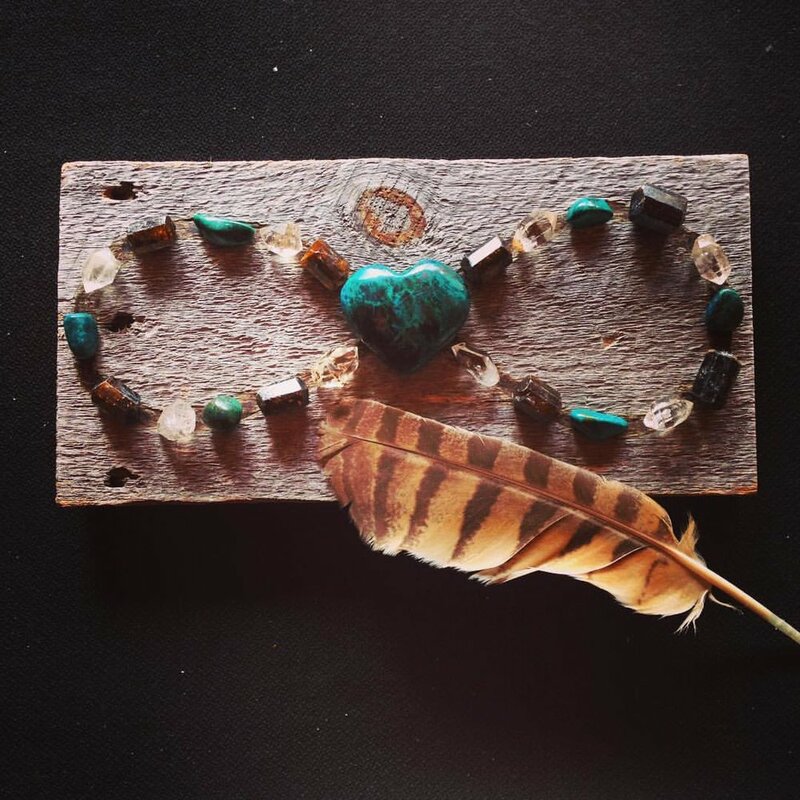 For my readers scattered to the four corners of the Earth, I am offering a Moon + Stone Healing package with a pair of my beautiful crystal healing earrings, a chakra balancing bath with crystals, and a hand-painted watercolor of Archangel Jophiel. 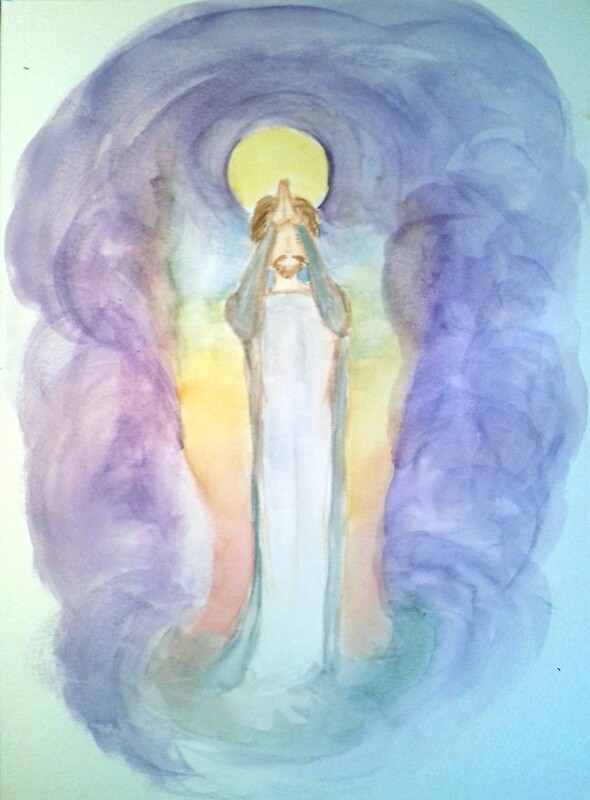 This painting is 5"x7" and perfect for an altar or sacred space. To enter this giveaway, you must comment on this blog post. If you are signed up for my weekly newsletter, mention that in your comment and you will get a second entry in the contest. Yes, you can absolutely sign up today for my newsletter. Sign up right here. 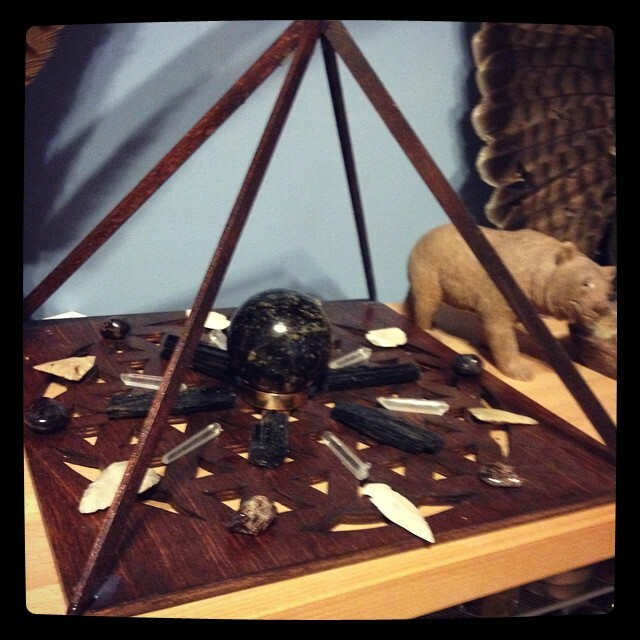 In your blog comment, please tell me how you found the Moon + Stone Healing, and what post has impacted you the most or what you like the most about this space. Also, if you are local, let me know that, so you can be entered for a free crystal healing. Heart: Love, compassion and balance. 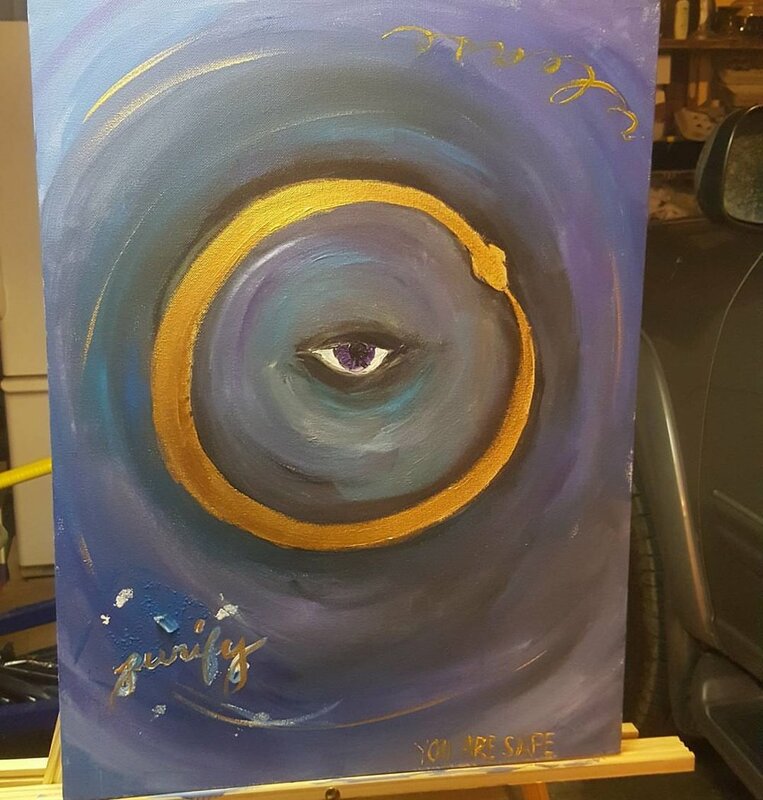 Third eye: Intuition, clarity, and visioning. Crown: Divine connection, prayer, and meditation. I honor you all deeply and am so grateful to each of you for allowing me to serve in this way. Thank you. I will choose a winner next Friday, August 16th. *By the way, enrollment is opening for both the CCH and ACM courses at Hibiscus Moon. 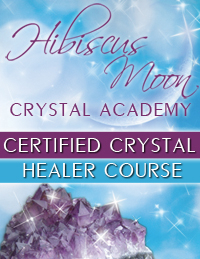 If you enroll in Hibiscus Moon Crystal Academy using my affiliate link, I get some beautiful energy, and you an amazing career. Click here to use my affiliate link to enroll. You won't regret it. UPDATE: the Contest is closed for now. Thank you for your interest.